The subject of ‘fracking’ – the process of injecting rock with a high-pressure mix of water, sand and chemicals to extract gas and oil – is highly controversial and viewed by many as a short-term answer to the much bigger issue of dependence on fossil fuels. With a backlash against the process growing in the UK, some organizations are trying to urge people to think about the potential ramifications of the practice. However, grass-roots campaigns and causes often suffer from the same problem: people just glaze over and carry along with their life unperturbed until it’s too late. That’s why at Central Saint Martins – University of the Arts in London, a ‘Hack the Frack’ event was held last month to raise awareness of the government’s open consultation and see if digital solutions could help drive the issue home. 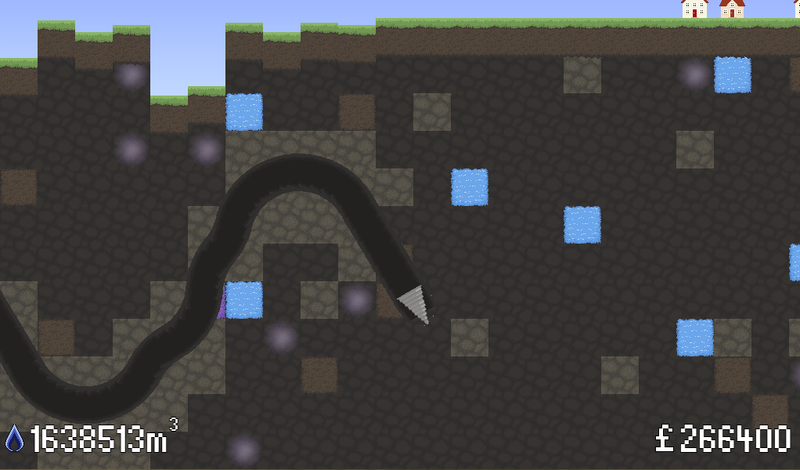 The first output from that session is the FRACKMAN Web game, arriving just two days before the government’s consultation on underground drilling access (which would allow fracking under homes without the owner’s permission being required) closes. To play is simple, you take control of a drilling machine and need to collect as much cash as you can by fracking away, but hitting the water supply will cost you cash and lead to your ultimate failure. Your machine bores downwards by default, so pressing up aims it elsewhere and pressing Space performs the actual fracking – that’s it, just try to keep away from the surface and water. While it’s a simple game, it’s nice to see a timely (the consultation closes in two days, did I mention?) game that raises awareness of an important issue – all the better that it doesn’t put you in the role of a protester trying to stop fracking, which would have been all too literal. 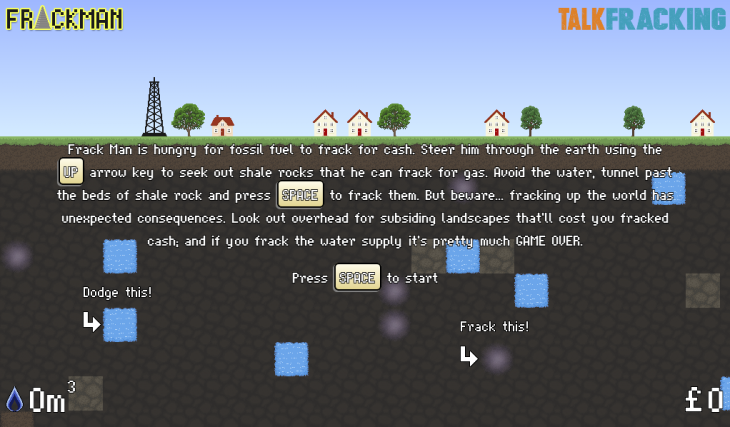 While this game isn’t going to end the practice, it does serve as a fun way to broach the subject to a largely disengaged audience and encourage people to have a say in the future of fracking in the UK. As long as you do it in the next few days.